Unreal! As much as the media wants to paint President Trump as the bad guy who canceled the Philadelphia Eagles’ White House visit, the blame is rest solely on the team. 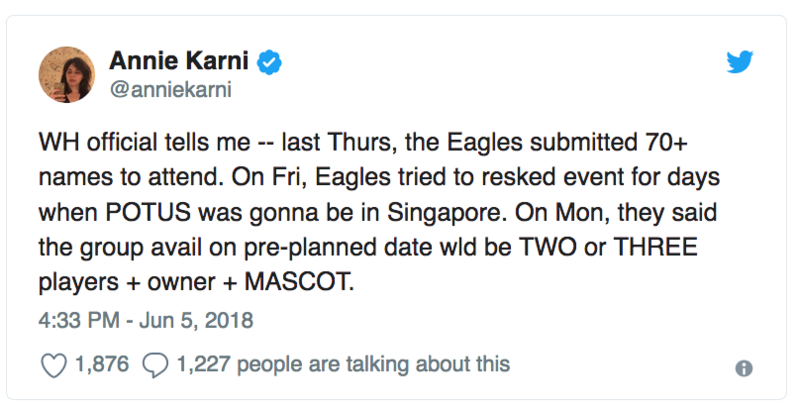 According to Politico, a white official said the number representatives from the Eagles totaled only five and one of them being the mascot. President Trump on Monday released a statement cancelling the White House visit and brought up the anthem protest as part of his reason to dance. The Philadelphia Eagles are unable to come to the White House with their full team to be celebrated tomorrow. They disagree with their President because he insists that they proudly stand for the National Anthem, hand on heart, in honor of the great men and women of our military and the people of our country. The Eagles wanted to send a smaller delegation, but the 1,000 fans planning to attend the event deserve better. These fans are still invited to the White House to be part of a different type of ceremony-one that will honor our great country, pay tribute to the heroes who fight to protect it, and loudly and proudly play the National Anthem. I will be there at 3:00 p.m. with the United States Marine Band and the United States Army Chorus to celebrate America.